Another great feature of SCCM is deploying operating systems. Although you can deploy a whole range of Windows versions, i’m going to focus on deploying Windows 7 with SP1 included. In order to support Windows 7 (with SP1), you’ll going to have to download and install an extra update from microsoft here kb2489044. Also, there is an extra issue to deal with. With the update above installed, it would be possible to support and deploy Windows 7 to known systems, meaning systems that are allready member of the domain and registered with sccm. Since we’re talking about deploying Windows 7, it is very well possible that a brand new system has been unboxed and you want to deploy it right away. So we’re dealing with unkown systems here. To support unkown systems, we need to have at least update R2 installed for SCCM 2007 SP2. But update R3 is out so we’re going to install R3. Before installing R3, there’s a prerequisite here: kb977384. Then download and install: Update R3 for SCCM 2007 SP2. The most easy way to deploy an image is to build a reference system first. This means a plain Windows 7 installation with only the essential software installed that you want to have on every pc. A virtual workstation, like one in VMWare, will do just fine. Download the latest installation media from Microsoft. As of this point: Windows 7 with sp1 included. Do not close the small sysprep (”Hulpprogramma voor systeemvoorbereiding”) window!!! As you’ll see, after every reboot, Windows will automatically reboot into Audit Mode again. Copy the content of “C:\Program Files\VMware\VMware Tools\Drivers” to a shared folder on your SCCM server, e.g. “\\sccm01\clientdrivers\x86\vmware client\”. This is to ensure we have the appropriate drivers for this system. We’re going to need this to create bootable media for capturing this system. Capturing the installation of the reference system is done through capture media. This is basically a Windows PE cd/dvd or usb stick that copies the content of the harddisk to a .wim file on an external disk or network share. When you think about that, it’s easy to understand that the PE environment needs to have access to the local harddisk and network interface. And that’s why you have to make sure these drivers are available and that’s why we have copied al the drivers to “\\sccm01\clientdrivers\x86\vmware client\” in the last step above. Now we have to update the capture media with those drivers. Add all drivers, one by one (although only the scsi and network drivers are really relevant) . Eventually click OK and click YES to update the distribution point, Next, Next, Close. Make sure you have a shared folder on your sccm server e.g. “\\sscm01\images” to store the image on. If you are working with a physical system, make sure you have burned the iso that has been created above. If you are working with vmware, put the iso on the datastore. Put the capture media in the dvd player. Autorun will start. If all goes well, you’ll eventually get a message “Image successfully captured …”. press OK and the client will reboot. You can then power it off. If you let it run, it’ll do some sort of “unattended” installation, but it’s pretty useless since the machine isn’t instructed properly what to do (e.g. like joining the domain, install extra components etc). From the SCCM Console, expand site database, computer management, operating system deployment, Operating System Images and rightclick “Operating System Images” and click “Add Operating System Image”. Rightclick the just created Operating System Image and click “Manage Distribution Points” and click Next, select “Copy the package to …” and click Next, select your SCCM server and click Next, Next, Close. If we’re going to boot from the network later on, and we need to access the distribution points, we need to authenticate. On the SCCM console expand site database, site management, <your site>, site settings, client agents and rightclick “Computer Client Agent” and select properties. Click on the “Set” button at Network Access Account. Pretty much everything is covered now. In red: The WDS (or SCCM) server is not responding. In green: the mac address of this client. What we need to do next is create a task somehow to deploy Windows 7 to this computer. On the SCCM console expand site database, computer management, collections, and richtclick collections en click on “New Collection”. No membership rules are needed so just click Next and click OK on the warning. On the SCCM console expand site database, computer management, operating system deployment, computer association, and richtclick computer association and click on “Import Computer Information”. Select “Import Single Computer” and click Next. On the SCCM console expand site database, computer management, operating system deployment, Task Sequences, and rightclick Task Sequences and click on “New, Task Sequence”. Select “Install an existing image package” and click Next. Select the Image Package (which is your previously captured image) and at Image select “All Images” (this is because a normal Windows 7 installation also contains a 100MB boot partition). Fill in the rest of the information, like the license code and type, and click Next. Click Browse to select the Configuration Manager package. Click Next. “Don’t install any software updates” and click Next, Next, Next, Close. There is a small “bug” in the default task sequence if you ask me. If you edit the task sequence, you’ll see that the network configuration is taking place before the device drivers are installed. This should be in reversed order. On the SCCM console expand site database, computer management, operating system deployment, Task Sequences, and rightclick the sequence created above and click on Edit. Select the green item called “Partition Disk” and in the “Volume” overview, you’ll see two volumes. One Primary volume with a fixed size of 100MB and one Priamary volume with a fixed size of the original disk of the reference system. Select that volume and click edit. Select “Use a percentage…” and set it to 100%. Click OK and OK. Hint: look at the partitioning settings and when formatting the disks, make sure you select quick format. Saves a lot of time! On the SCCM console expand site database, computer management, operating system deployment, Task Sequences, and rightclick the sequence created above and click on Advertise. Click on the browse button to select a collection and select the “Deploy Win7 with SP1” collection that we have created before. Also select “Make this task sequence available to boot media and PXE”. Click Next, Next. At the Distribution Point screen, make sure you also select “When no local distribution point is available, use remote distribution point” and click Next, Next, Next, Next, Close. If you go to the “Deploy Win7 with SP1” collection, doubleclick on the “Win7-001” and go to the advertisements tab, you’ll see that the “Install Windows 7 with SP1 on new systems” is assigned to this computer. That’s it. 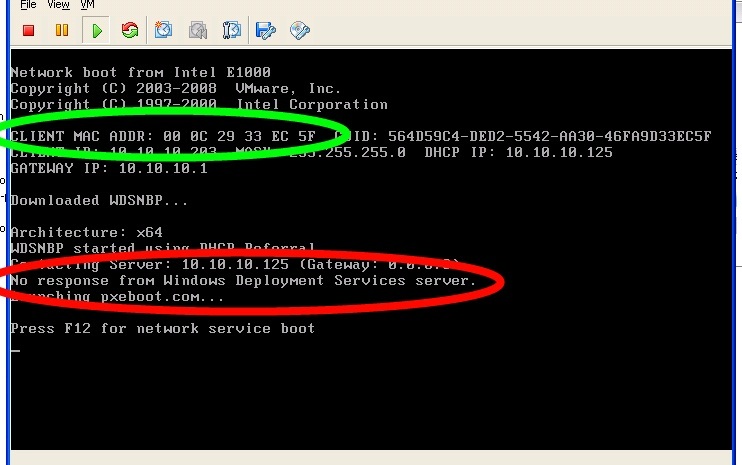 Perform a network boot and sit back!